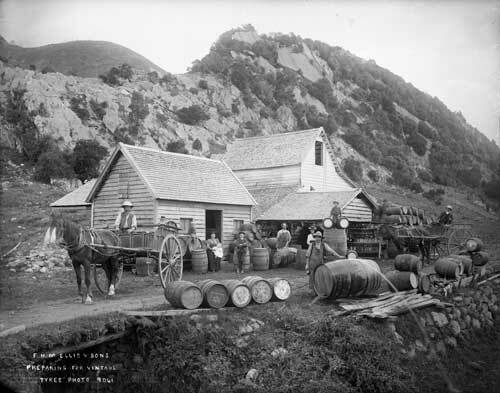 Francis Henry Montagu Ellis and his family pose outside their winery while preparing barrels for a new vintage, in the early 1890s. Located at the base of the Pikikiruna Range on the eastern side of the Tākaka valley, the Ellis winery and vineyard was well known to the gold miners and farmers who settled the Golden Bay area in the Nelson region in the late 1800s. The vineyard was planted on lime-rich soils and benefited from the region’s long, hot summers.